Music composer software provides the perfect selection for beginners who want to learn about basic knowledge of staff, music theory, harmonic, etc. Advance songs composing tool contain simple and easy to use interface that allows user to easily and effectively composing music without using operation guide. Added support to edit music file into MIDI file information easily. ...... file formation easily. Sheet music composer application allows user to select one of inte, normal, bridge, fillin1, fillin2, endinf section for each style to edit melody track for any song. Download free music composing program to create, import and export midi file. Professional music composer software is audio songs creator tool with automatic accompaniment function and built-in 100 accompaniment styles to make it easy for user to quickly design perfection song. 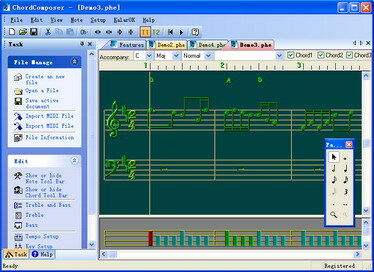 Song composing software facilitates user to choose chord type to edit music and main melody by 1 or 2 tracks in one song. Qweas is providing links to Audio Songs Creator Software 6.12 as a courtesy, and makes no representations regarding Audio Songs Creator Software or any other applications or any information related thereto. Any questions, complaints or claims regarding this application Audio Songs Creator Software 6.12 must be directed to the appropriate software vendor. You may click the publisher link of Audio Songs Creator Software on the top of this page to get more details about the vendor.